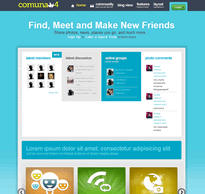 I'm not convinced about JomSocial, why have your own social network and the hassle when you don't need it, but I do like Template Plazza themes and like all Joomla themes, you don't need to install the extensions they are built around and this one has a nice catchy look to it. It is basic, but you also have the functionality of Joomla behind it, loads of typography (which does look like it needs a bit of work on the demo site) and it is bold. It is also powered by the TP Framework, which is becoming popular and does make managing themes and options much easier and much more abundant, but most theme providers have them these days and if they don't, look for one that does. So, a nice theme for JomSocial if JomSocial is your thing and if it isn't, a nice simple theme for Joomla with loads of module positions, quite a few features and a very easy install.